Canon Pixma TS9050 printer is the flagship of the PIXMA series. It is a feature-packed all-in-one inkjet colour printer, which offers supreme printing excellence, whether it is for elegant documents or high-quality photographs. The printer has compact dimensions of 14 x 37.2 x 32.4cm and weighs about 6.7 Kg. Also, the printer is compatible with MAC and Window operating system. Due to its mirrored and matte texture on the printer, it is preferred in office space or home decor. Luxuriously-sized and highly-responsive colour 5-inch LCD touchscreen on the front panel allows easy handling. The Pixma TS9050 printer offers multiple wired and wireless connectivity options. One can easily print photos and documents from wherever they are with Ethernet, Wi-Fi, Android, iOS, Windows 10 Mobile, and Google Cloud Print. Also, the NFC-equipped Android devices let you scan and print with just a touch! To visualize each and every detail of your artwork the printer provides lab-quality photos. The print quality is enhanced with the 6-ink-cartridges. The ink cartridges work well with all types of media including A4/A5 (normal and glossy), envelope, letter or any square sheet. Canon Pixma TS9050 printer is a brilliant choice for the one who is looking for some smart and elegant printer and is not worried much about the cost rather than print quality. It is a small and sophisticated printer with many features that could reduce the printing burden. To curtail the maintenance cost, one can buy XL (XXL for black)-Canon Pixma TS9050 ink cartridges. Large touchscreen display, a fast scanner unit, and ADF are crowning accomplishment for the printer. What to do if the printing does not start for Canon printer, even after installing the Canon Pixma TS9050 ink cartridges? Step 1: The Canon Pixma TS9050 ink cartridges installed in your printer should be compatible with your Canon printer. Step 2: Make sure that the printer is firmly plugged in. Press the ON key to turn on the printer. Step 3: Check whether the printer and the computer are connected properly. Step 4: Verify that the paper settings match the information set for cassette or rear tray. Step 5: The printer output tray should be at its normal print position. Step 6: The page size settings and the media type settings of the printer driver should be accurate. Either A4 or Letter is selected in the page size application. The paper selected for the Media Type in the printer driver matches the paper loaded in the printer. Step 7: Make sure that your printer’s driver is selected when printing. The printer won’t print if you are using a printer driver for a different print. Warning: Avoid using dry Canon Pixma TS9050 ink cartridges for any type of printing. How to uninstall Canon PIXMA TS9050 Driver for Canon printer? Step 2: Select Control Panel. Step 3: In Control Panel menu, choose to Uninstall a Program. Step 4: When the Uninstall Program menu opens, select that the driver printer that you would like to uninstall. Step 5: When the uninstalling process finished, you need to restart your computer such that the computer starts working normally again. Q. How many colours are available in Canon Pixma TS9050 Ink Cartridges? A. Canon Pixma TS9050 Ink Cartridges are available in 5 different colours: Black, Grey, Magenta, Yellow and Cyan. Q. Will I receive a set of Canon Pixma TS9050 Ink Cartridges in the box when I buy the Canon Pixma TS9050 printer? A. Yes, you will receive a set of Canon Pixma TS9050 Ink Cartridges in the box of the Canon Pixma TS9050 printer. You can buy more ink cartridges for this printer when the starter ink cartridges run out. You can find a range of Canon Pixma TS9050 Ink Cartridges on our website. Q. What are compatible ink cartridges? A. A compatible cartridge is an ink cartridge that is not manufactured by a third party and not the original manufacturer of your printer. It functions and works in the same way that an original cartridge does. Our compatible ink cartridges are rigorously factory tested to the same ISO standard as the original brand ink and are much cheaper compared to the original ones. Q. What is the warranty period of your compatible Canon Pixma TS9050 Ink Cartridges? A. Our ink cartridges have a warranty period of 12 months. In the event that a compatible or remanufactured product is deemed to be faulty, we will replace or refund the item within the warranty period. Q. 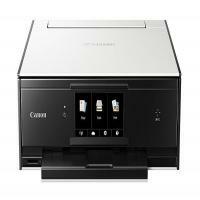 What are the connectivity options available with the Canon Pixma TS9050 printer? A. With the Canon Pixma TS9050 printer, you can print photos and text documents from anywhere with Wi-Fi. Printing directly from Android, iOS, and Windows 10 Mobile devices are enabled. Cloud-based services through Google Cloud Print are provided. NFC is enabled where NFC-equipped Android devices let you scan and print with just a touch. This printer can also be connected using Ethernet. Q. Can Canon Pixma TS9050 printer print photos directly from a memory card? A. Yes, this printer allows printing directly from a memory card without the use of a PC.